A love deity is a deity in mythology associated with sexual love, lust or sexuality. Love deities are common in mythology and may be found in many polytheistic religions. Mami Wata (Mammy Water) is venerated in West, Central, and Southern Africa, and in the African diaspora in the Americas. Mami Wata spirits are usually female, but are sometimes male. 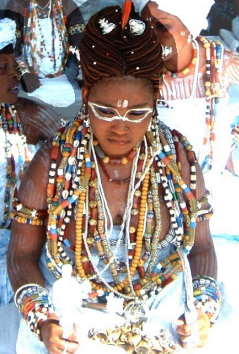 Oya (known as Oyá or Oiá; Yansá or Yansã; and Iansá or Iansã in Latin America) is an Orisha. She is either syncretized with the Virgin of Candelaria or St. Therese of Lisieux. Yemoja is an Orisha and the mother of all Orishas. She is syncretized with either the Virgin Mary, Our lady of Regla, or Stella Maris.